We were discussing the geothermal project in Cornwall the other day, and questioned the similarities between geothermal (good), and fracking (bad). by perhaps a few millimetres, causing what are referred to as ‘microseismic events’. This is inevitable and expected. These events can be detected and located with highly sensitive instruments and their distribution can be used to help understand the extent of the reservoir. The vast majority of these events will be far too small to be felt at the surface but it is possible that some will be, with some minor vibrations perhaps comparable to the mining blasts that were felt when the tin mines were in operation. In order to ensure that geothermal development does not create an unacceptable risk of seismic activity, as set out in the Council supplementary planning guidance, a seismic hazard assessment should be undertaken that considers: pre-project seismic activity, the likelihood of triggering an event and measures to avoid it. Ongoing monitoring throughout the lifetime of the plant will be adopted and maximum acceptable levels, as imposed by the Council, should not be exceeded. When looking at the risk, the earthquakes of at the Basel project in Switzerland are often mentioned. The geology in Basel is very different to Cornwall’s: Basel is situated in an unstable tectonic region with a long history of earthquakes. What impact will it have on water? During the drilling and development stages of the project, a large source of fresh water will be required. The Council’s Supplementary Planning Guidance advises, as far as possible, that drilling and stimulation fluids should be re-used in order to reduce freshwater resource impacts and potential disposal issues. Drilling and stimulation fluids not reinjected should be stored in tanks, with appropriate spill protection. During operation the water requirement will be minimal, perhaps zero. This is because the water will circulate in a closed loop; down one well and up another and the reservoir will be operated at zero water loss as far as possible. Each of the wells will be steel lined to considerable depth and therefore there will be no risk to ground water supplies. Any water produced during testing will be contained, treated if necessary, and disposed of in an environmentally sensitive manner. Will there be increased traffic or heavy plant to the site? Normal day to day traffic will not add significantly to the existing levels on the industrial estate. The main impact to the local transport network will be during the mobilisation and demobilisation of the large drilling rig, each of which will involve HGVs transporting equipment on and off the site over a few days. A traffic management plan may need to be prepared and agreed with the Council in order to avoid unnecessary local traffic disruption during this time. How noisy will the drilling be? It will take around 6 months to drill the two wells. For both engineering and financial reasons drilling will take place 24 hours a day, 7 days per week. There is therefore a potential for noise nuisance during the night. The Council’s Supplementary Planning Guidance sets out the noise limits for different proximity to receptors and states that developers should demonstrate throughout the construction, operation and decommissioning phases of a deep geothermal development, all practicable measures will be taken to minimise noise emissions. Noise will be one of the most important criteria used to choose a drilling rig. Rigs designed specifically for use in populated areas and urban environments will be favoured. Further noise reduction measures on the site boundary will be put in place if required. The power plant will be small and will be designed with the specific site location in mind. Detailed planning permission will be required for the plant and will be subject to noise limits. Different plant types have different noise characteristics; Water-cooled power plants are extremely quiet whereas air-cooled plants have some fan noise (but are currently used in European power plants operating close to residential areas). What is the risk of radiation from the granite? Radon and background radiation is naturally produced by the granites and clays of Cornwall. The radioactive decay is the reason the granite is heat producing. During drilling the level of radon emitted is not considered to have a significant impact and water quality will be monitored and carefully managed. During operation, all water will circulate in a closed circuit so radon gas will not be emitted. Longer term, any build-up of radioactive minerals will be safely removed from site and dealt with. What is the visual impact? During the drilling phase, the drill rig will be visible from outside the site. It is likely to be 25-30m high. Lighting will be arranged to minimise light pollution and nuisance at night. Geothermal power plants have a relatively small footprint on the landscape, and don’t require the storage, transportation, or combustion of fuels. Air-cooled plants are quite unobtrusive. The structure of water-cooled plants is also unobtrusive but water vapour plumes would be visible under some weather conditions. Site selection, design and layout can minimise the visual impacts of all development. This is considered in detail in the Council’s Supplementary Planning Guidance with specific consideration given to tourism, designated and protected areas, ecology, open areas, the character of an area and the views of nearby residents. What is the difference between EGS and ‘fracking’ for shale gas? Before considering the process it is important to understand the benefits of geothermal energy; it is a clean renewable technology that emits very little gases and does not contribute to an increase in greenhouse gases and climate change. With the Council’s involvement, the benefits from locally generated heat and power can be kept local. Fracking for shale gas uses much higher pressures to initiate new fractures in un-fractured shale rock, which result in wide cracks that require additives (sand and chemicals) to hold them open. Only some of the fluid returns to the surface, where it is sealed in containers before treatment. Licences require operators to minimise the release of gases: when it can’t be economically used, natural gas must be ‘flared’ to reduce its global warming emissions and the gas may only be ‘vented’ – released into the air – when necessary for safety. The process used to open and enhance pre-existing fractures in granite uses the rough surface texture of rock fractures to allow self-propping of open fractures, so there is no requirement for any chemical additives in the pressurised water: this reduces the risk of ground water contamination. This process takes place at depths of 4 km and deeper, where there is no natural gas or drinkable water present. During operation the water is circulated in a closed-loop: there can be no release of gas or minerals at the surface. When you get down to basics, there seems to be little difference between the two processes. About the only issue of substance is that geothermal is said to go to greater depths. However, as fracking also takes place well below the water table, it is not clear why this should make any real difference. Also with geothermal comes the risk of radon contamination. Interestingly, Cornwall CC state that there will be no risk to water supplies as each of the wells will be steel lined to considerable depth. Fracking operations also of course are regulated to provide the same protection. Earth tremors (always labelled as “earthquakes” where fracking is concerned. The need for large amounts of water during the drilling stages. Increased heavy traffic for short periods at the start and end of the project. Noise nuisance during the drilling phase. 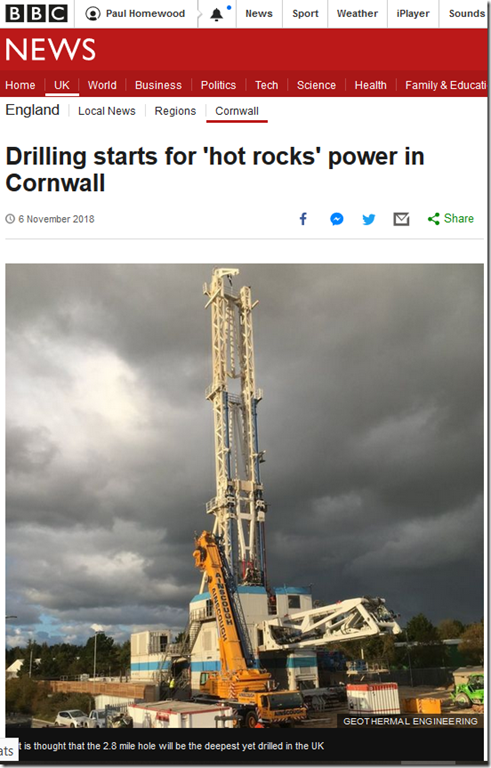 But as Cornwall CC point out, geothermal energy is a clean renewable technology, so its environmental impact does not matter!